Apparently edamame and soybeans are the same thing. But I feel better eating "edamame" for some reason. Maybe it's because I always associate them with fine Japanese dining. I associate "soybeans" with Monsanto for some reason, and then I start thinking about genetically-engineered foods and biotechnology, and all that stuff just makes me grimace and not want to eat. Despite the fact that there's a good chance the edamame in this bag had something to do with Monsanto, I will remain willfully ignorant of such facts, and what I don't know won't hurt me. In the past, we've seen our boy Trader Joe do good things with edamame. And of course, he's done good things with seaweed and tofu, too. So it's no surprise that the taste of this vegan, new age, frou frou hippie stuff is actually shockingly good. Although, we must point out that there wasn't really much tofu in this dish. We didn't see it. We didn't taste it. That doesn't mean it wasn't there. But if it was, there was barely a hint of it. Likewise, there are no chunks or sheets of seaweed, but rather just tiny little flecks of it everywhere. It was almost as if the seaweed was used as a seasoning rather than a main ingredient. But that's just fine with me, because it tasted great. The edamame beans were plump, green, and happy. And there were lots of carrot slivers throughout the product. The overall texture was really nice. The flavor, though pleasant, was not very strong. To give everything a bit more kick, we added soy sauce and our favorite, Sriracha hot sauce. That made the dish really tasty. Have you noticed I'm on an italics kick lately? I've used italics in every paragraph so far. But that's neither here nor there. If you want to watch Sonia and I try it for the first time and also get a glimpse of the prepared product outside of the packaging, just click here. 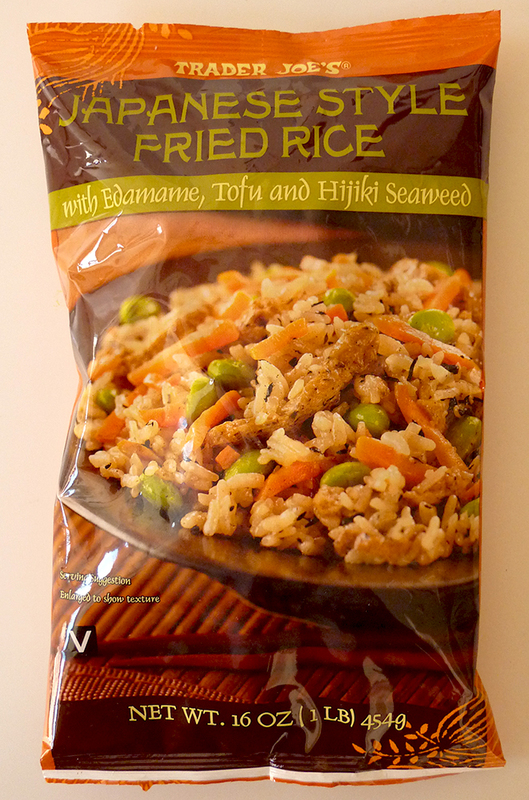 Sonia gives this Japanese Fried Rice 4 stars, docking a point mainly for the lack of tofu. I give it 3.5 stars. We love this rice, even my kids ask for it. Its great with the orange chicken. This has become my new favorite TJ item. As a seaweed lover, I enjoy that the flavor is in every bite rather than there being just pieces of seaweed. 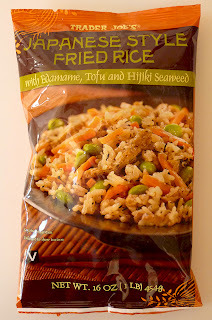 I've eaten a ton of this rice but, as you mentioned, the tofu has been nearly nonexistent every time. Agree with the others, this item is fantastic! True. It has been brought to my attention that TJ's does NOT use genetically engineered soybeans! Or GMO's of any kind! Tofu or no tofu, I happen to love this rice. It does need a little seasoning. I picked this up again today. Try it with a drizzle of low sodium soy sauce and it's just about perfect. I'm having this with the orange chicken tonight. yeah, TJ branded items do NOT use GMO. thank god. My favorite thing from TJ's so far, to buy all these ingredients would be so expensive! We LOVE this rice. I can eat a whole bag myself when I want a treat, but usually we make a bag of this rice and mix it with a bag of the Confetti rice, and top it with the orange chicken. This is one of my favorite TJ items. I use a little coconut and sesame oil in the pan as well as soy sauce at the end. Squeezing a lime over it and adding avocado chunks also kick it up.